Snowbird is a lightweight Windows Explorer alternative that offers its users some extended functionality. The portable software program is compatible with Windows XP and above and comes with a tiny size of 468 Kilobytes unpacked. The interface of the computer program has been divided into three areas. The header area containing menus and the breadcrumb navigation, the left sidebar that contains a list of all local and network drives including their folders and the main area that displays the files and folders that are located in the current directory level. Some might say that this does not sound exciting enough to give it a try. Snowbird comes with an advanced feature set that might entice some users to give it a try though. 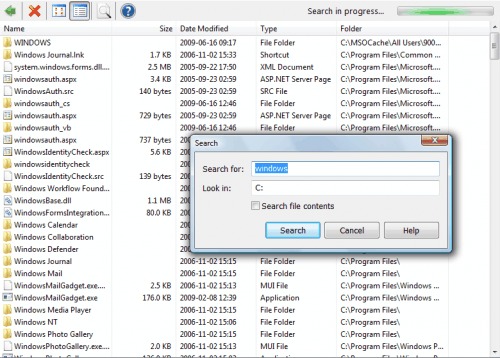 The Windows Explorer alternative offers a search form right in the interface which can search for files, folders and even file contents. It is furthermore possible to navigate with mouse gestures which can speed up folder navigation quite a bit. The overall speed of Snowbird is fast, faster than that of Windows Explorer especially when navigating in network shares and large local folders. There is however one aspect that is not well designed. The only way to copy or move files is to mark them, right-click and select the appropriate option from the menu. In other words: Drag and drop is not supported. Very impressive operation speed but startup feels really slow. It probably indexes directory tree ahead or something. As for network shares it failed to open password protected network disk. Explorer ask for password but Snowbird failed with error. And I’m still looking for a windows explorer replacement which lets me have tags used in a convenient way. If you like native Explorer try Q-Dir. It’s like few Explorer windows packed together and enhanced with additional nifty features. I’ve tried it before and threw it away again, didn’t really feel like an improvement. I’ve just installed it again, I’ll just give it a try again, see how I like it. This tool is very useful for me. Very impresive speed and fits my needs. While this looks good, I prefer the more feature packed explorer replacements. Although comming from an opera user, mouse gestures in my explorer program would be welcomed. That’ll be xplorer2 lite (The “2” is squared). I use it instead of Win Explorer, and it’s working perfectly. Also, any add-on for Win Explorer can be installed on Xplorer2 lite. There is a paid version, but the free version is good enough. Martin, thanks for writing about SongBird, and Rarst, thanks for suggesting q-Dir, which is also quite good. – I can’t remove the breadcrumb above my regular view. I’m sure people use it, but I don’t but I don’t know how to get rid of it. What would be really nice is an Adobe Bridge like approach of keywords, collections and smart collections. does anyone know of a explorer replacement that display folder size (and works on vista+ ) ? I’m interested in a replacement for Windows Explorer, there are lots out there that look very interesting, but I use Winkey+E to open it and I don’t want to lose this. I haven’t found a way to change the program it links to – anyone know? @David: Did you ever find a way to change Win+E to open an explorer replacement? @Rick: I wish. I believe it is possible with AutoHotKey but it’s not something I’ve looked into as yet. I have been trying dozens of Explorer replacements and one claimed to replace Explorer for Win-E but it didn’t work. There may be a registry setting that we could use. Others do replace Explorer easily for opening folders and shortcuts to folders. I’ve been thinking I’ll just find a small, lightweight, portable hotkey program and associate Win-W (W being right next to E and such)…or maybe there’s a hotkey program that can override Windows built-in hotkeys. UltraExplorer has it built-in (Tools -> Shell Extension -> Win-E Hook) but it didn’t work for me. That must have been the one I forgot to make specific notes about earlier. It would probably work better if I installed it instead of extracting its setup.exe file using 7zip…. I ran Sysinternals Process Monitor to see what it’s doing when I enable Win-E Hook and it’s just running its own program, basically a hotkey watcher whose only job is to watch for Win-E. Recommendation: If you like speed and don’t want to wait for a file to be moved from one folder to another, try this out!! Sounds good, but drat… I’m a fan of drag and drop. I like the speed of Snowbird, and don’t care about some missing options compared to Windows Explorer, but I do have 1 serious problem: I cannot see my Windows 2003 and 2008 server shares. Windows NT4 and Windows 2000 server shares are OK.
My PC is Windows XP SP3, logged in on a Windows 2003 domain. I don’t agree that it is fast because it is not displaying few detail information, this is faster than DOS commands like “dir”, even if you perform it on network mapped drive. Any Idea how such performance can be achieved..?